In short I feel you can get pretty close to the ‘correct’ answer relatively quickly and the rest of the time is spent on trying to remove as much bias as possible. It’s a clear case of the law of diminishing returns and the elephant in the room is the missing trials/data. If you rely on published articles (as most systematic reviews do, see Schroll et al 2013) you cannot assume you have an accurate assessment of the worth of an intervention (see Some additional thoughts on systematic reviews). I feel there is a cost-benefit discussion that needs to be had, somewhere, sometime soon. Perhaps at Evidence Live 2016. The other notable lessons are 6 (conclusions between rapid and systematic reviews don’t really differ) and 7 (research is needed). 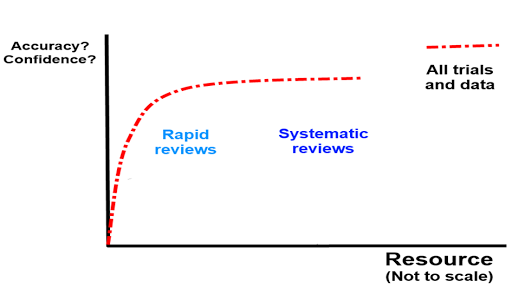 We need to explore the reasons for doing systematic reviews and instead of simply saying, when faced with uncertainty, that we need a ‘systematic review’ we need to better understand what the implications are (financial and opportunity cost, time possibly wasted etc). In many situations a rapid methodology will suffice. But we need to be informed as to when it’s ‘safe’ to use rapid methods and when it’s not. Equally, when is it not safe to rely on ‘standard’ systematic review methods (e.g. in the case of Tamiflu). As a non-academic I feel don’t feel conflicted to say we ‘need more research’.